From left to right: Grace Masback ’21; Annabel Barry ’19; Alexander Gottdiener ’19; Rasheeda A. Saka ’20; Kiara Gilbert ’21. Not pictured Lavinia Liang ’18. 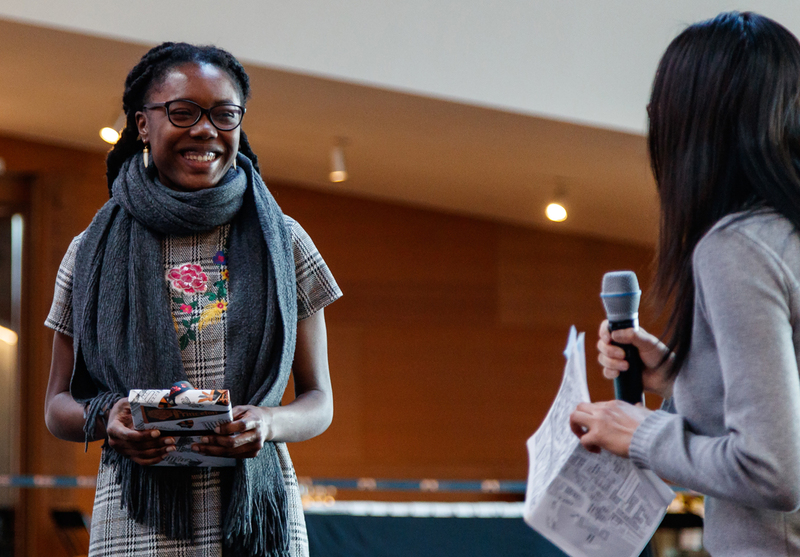 Last Sunday, the Friends of the Princeton University Library gathered at the newly opened Lewis Arts Complex for their spring dinner and for the announcement of the winners of the 93rd annual Elmer Adler Undergraduate Book Collecting Prize. 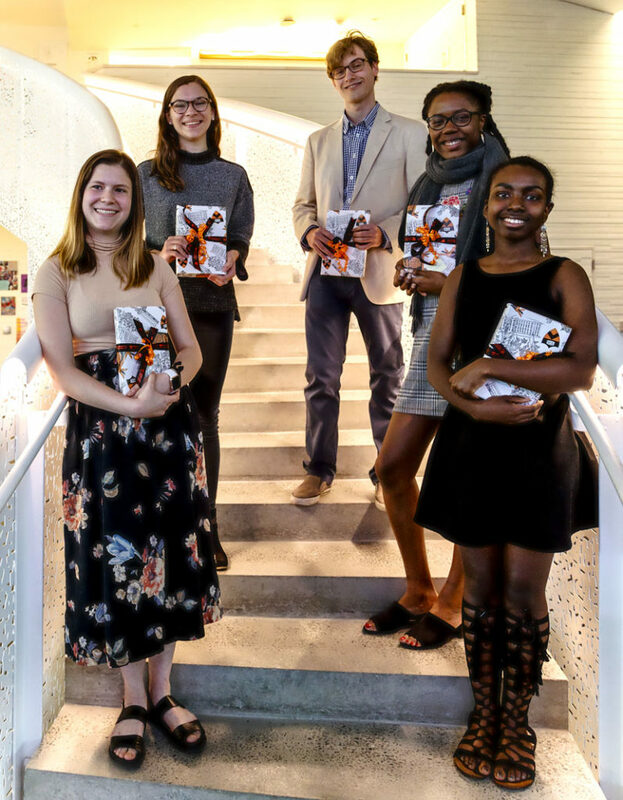 This year, the essays were of such high caliber and the individual collections so compelling that the judges gave out more prizes than any other year in recent memory. Congratulations to our first prize winner: Annabel Barry, Class of 2019, for her essay “The Emigrant’s Dilemma: Collecting Books About Ireland,” which unravels her act of collecting books about and from Ireland as an intimate journey of discovering selfhood, a journey that eventually brought her to Ireland, merging a literary island with its physical landscape. 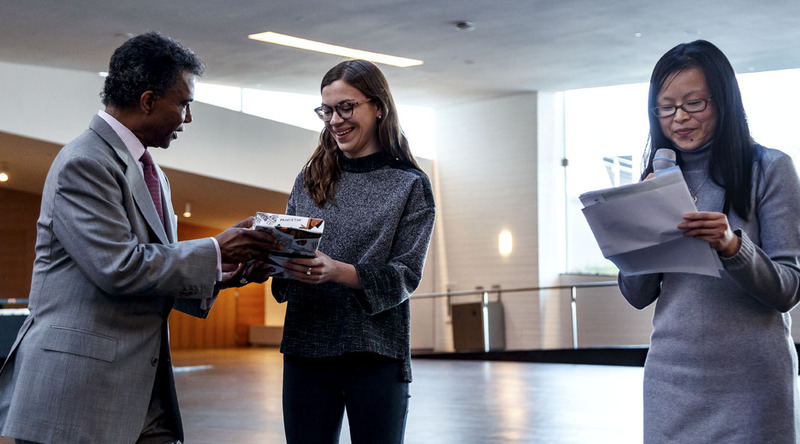 Annabel receives a check for $2,000, a certificate from the Dean, and a book donated by Princeton University Press to complement her collection: Ireland’s Immortals by Mark Williams (2016). Annabel’s essay has been submitted to the National Collegiate Book Collecting Competition representing Princeton University. We wish her luck! There was a tie for second prize, awarded to Grace Masback, Class of 2021, for her essay “The Wonder of the Mile: A Collection and an Enduring Connection,” in which Grace describes her collection of books, videos, drawings, photos, and autographs connected to the history of the mile run, in particular biographies of great milers. Second prize also went to Alexander Gottdiener, Class of 2019, for his essay “Bohemian Waxwing Rhapsody,” that shared with readers his life-long passion for ornithology, enlightened us about the fine nuances of bird species, and gave a connoisseur’s comment on what different field guides to birds each have to offer. Both Grace and Alexander receive $1,500, a certificate, and a book from Princeton University Press. For Grace this was Gaming the World: How Sports Are Reshaping Global Politics and Culture by Andrei S. Markovits (2010) and Alexander received All about Birds, A Short Illustrated History of Ornithology by Valérie Chansigaud (2010). Third prize went to Kiara Gilbert, Class of 2021, for her essay “The Coalescing of Legacies: Herodotus, Pynchon, and Malcolm X,” in which Kiara relates the unflinching trajectory of her personal growth and intellectual maturation shaped by the collection she has amassed with the least resource available to her since childhood. The end result is a collection that reconciles and embraces both classic literature and Black intellectualism, mirroring the collector’s growing sophistication while carving a challenging path towards an in-between space. 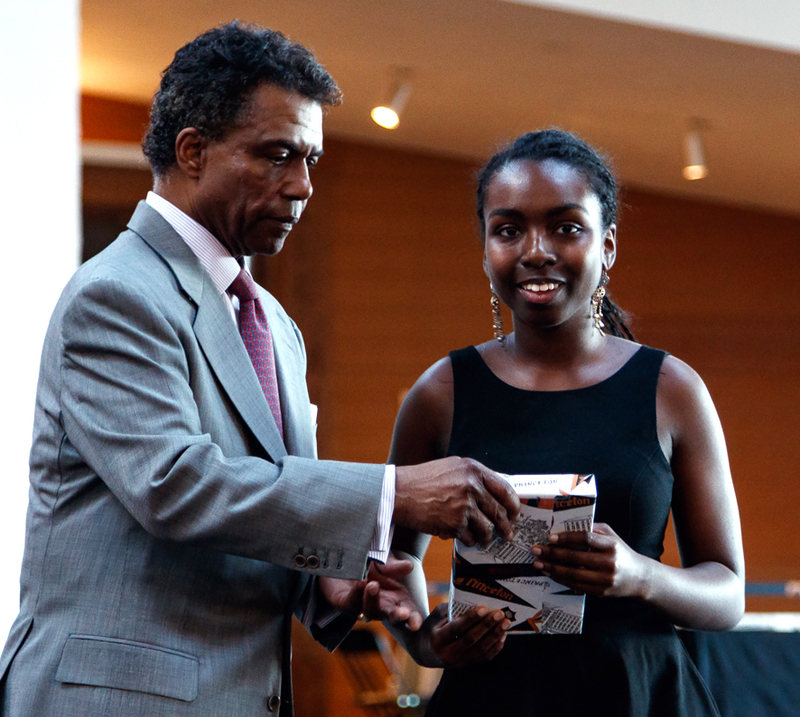 Kiara receives a check for $1,000, a certificate, and a copy of American Crucible: Race and Nation in the Twentieth Century by Gary Gerstle (2001). Two honorable mentions were also awarded. The first to Lavinia Liang, Class of 2018, for her essay “In Pursuit of Broken Mirrors: Resisting Essentialism In Contemporary Asian American Fiction.” Lavinia described with painful candor her uneasy relationship with fiction by Asian American authors, in her yearning pursuit for immigrant narratives that are recognizable and comforting. She received a copy of America’s Asia: Racial Form and American Literature, 1893-1945 by Colleen Lye (2009). An honorable mention also went to Rasheeda A. Saka, Class of 2020, for her essay “The Lost Art: Freeing my Creative Imagination through the Works of Nigerian Authors,” describing a body of diverse and multi-dimensional novels, short stories, and plays by Nigerian authors she has curated, and reflects on how that collection emboldens her own literary voice and liberates her imagination. She was given a copy of Bearing Witness: Readers, Writers, and the Novel in Nigeria by Wendy Griswold (2000). Prizes were announced on Sunday by Minjie Chen, who will be administering next year’s prize and P. Randolph (Randy) Hill ’72, chair of the Friends of the Princeton University Library. Special thanks to this year’s judges: Minjie Chen, Eric White, John L. Logan, Claire Jacobus, and Kent Cao; overseen by Julie Mellby. This entry was posted in Adler Book Collecting Competition on April 24, 2018 by Julie Mellby.